If you're self-conscious about cracked, broken, decayed, or worn teeth, we can bring back your healthy, natural-looking smile with white fillings and/or dental crowns. These tooth-colored alternatives to traditional metal fillings and crowns allow our patients to maintain bright, white smiles while restoring their oral health at the same time. Why Choose Joe Isaacson Dental for Tooth Colored Fillings & Crowns? 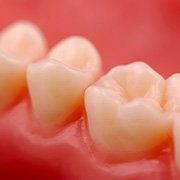 Composite resin fillings represent several advantages over traditional silver or amalgam fillings. Because composite resins are not made of metal, we can blend and mix shades to find the perfect color to match your natural teeth. This means only you and your dentist will know you have fillings. Another pro is that the tooth/composite bond actually supports the remaining tooth structure, deterring breakage and insulating against temperature changes. Best of all, composite resins allow us to keep more of your natural tooth structure intact than amalgams. We believe in conservative dentistry – the more natural tooth structure you keep, the better teeth you’ll likely have in the future. Also called caps, crowns can return structure, strength, and function to a tooth with extensive decay or damage. Designed to fit snugly and function as a healthy tooth, a crown will protect your tooth from further damage and preserve the jaw's correct natural alignment. 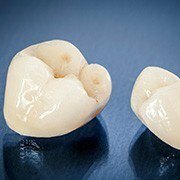 We use precious metal, porcelain pressed (or fused) to metal, or all-porcelain crowns. To maintain a fully white smile, we recommend all-ceramic crowns. Our precise color-matching system allows us to find the right shade of porcelain to blend with your natural tooth color. Porcelain crowns are also extremely durable and long lasting, and these benefits make them popular with dentists as well as patients.